How to use the Poisson calculator? What does the Poisson distribution look like? When not to use the Poisson distribution? 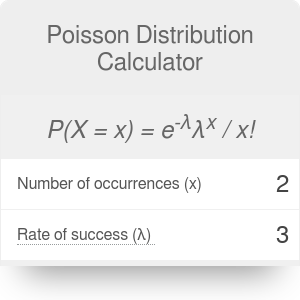 If you want to know what the probability is of an event happening a number of times over some interval, this Poisson distribution calculator is your go-to tool. Read on to find out what kinds of events are suitable for analysis using this calculator, and what is the Poisson distribution formula. We will present some Poisson distribution examples, too. The Poisson distribution is a probability distribution (such as, for instance, the binomial distribution). It describes the probability of a certain number of events occurring during some time period. For the most part, you may use past data to figure out this probability, and learn about the frequency of events. For example, if we know that the typical number of tornadoes a certain region experiences over 10 years is 5, we can calculate what is the probability of no tornadoes troubling this area during the next 10 year period. We can also find what the probability is of any other number of tornadoes appearing there during next 10 years. Number of visitors in a museum between 10 am and 11 am. As you can see, the Poisson distribution is a convenient way of characterizing events that are independent of each other, and their probability does not vary over time. You can think about such events as accidents that happen at random, but sooner or later they inevitably appear (like when the bus is 20 minutes late and then 2 appear at once). To calculate any of the values specified above, you need to know the average number of events - for instance, the average number of buses at a bus stop during a one hour period. This value is called the "rate of success" and denoted with the symbol λ.
P(X = x) = e^(-λ) * λ^x / x! Remember that both λ and x must be non-negative integers (0, 1, 2, ...) to fulfill the Poisson distribution definition and return meaningful probability estimates. If you don't want to use the Poisson distribution formula, you can simulate this distribution with the SMp(x) function. Determine the rate of success - the average number of events. Let's say that the average number of buses per hour is 5. Decide on the number of occurrences. Let's say you want to find the probability of only exactly 3 buses arriving during an hour. Input the values of λ and x into the equation above. P(X = 3) = e^(-5) * 5^3 / 3! Calculate the probability manually or using the Poisson distribution calculator. In this case, P(X = 3) = 0.14, or 14%. P(X < 3): probability that there will be less fewer than 3 buses per hour (so none at all, one or two). P(X ≤ 3): probability that there will be at most three buses per hour (none, one, two or three). P (X > 3): probability that there will be more than three buses arriving per hour (so four, five... up to infinity). P(X ≥ 3): probability that there will be at least three buses arriving per hour (so three, four, five... up to infinity). If you are interested in statistics, make sure to check out the p-value calculator too! The different probability values you can get using the Poisson calculator make even more sense when you know their graphical distribution. Take a look below at the probability mass function we generated using the ggplot2 package in R.
For a given number of events x the function takes a value of P(X=x) (coordinates of points in the plot), while its shape depends only on the rate parameter, λ. You can easily find out how the probabilities change for different chances of success and the same number of events. Compare P(λ=2; x=3)=0.224 and P(λ=8; x=3)=0.029. The first event is 7.7 times more likely to happen! On the other hand, when you use the Poisson calculator to find out cumulative probability, you're looking at a certain area below the function. For example, the cumulative probability P(λ=5; x<4)=0.265 is the area on the left from the point P(λ=5; x≤4)=0.176, and below the green line. This values can also be found in the Poisson distribution table. Note that for the lowest values of λ, the Poisson distribution is strongly asymmetric and right-skewed, with highest probabilities assigned to the very first occurrences of an event. When λ increases, the probability distribution gets more evenly dispersed and similar to the well-known bell curve, as implied by the central limit theorem. You can play around with the Poisson calculator to find how low the probability values actually become when we consider very large numbers of events. Poisson's original formulation of his probability distribution was often called the law of small numbers, as it applies to an event that happens rarely, but has many opportunities to happen. In other words, the chance of success is small, but the number of trials is large. 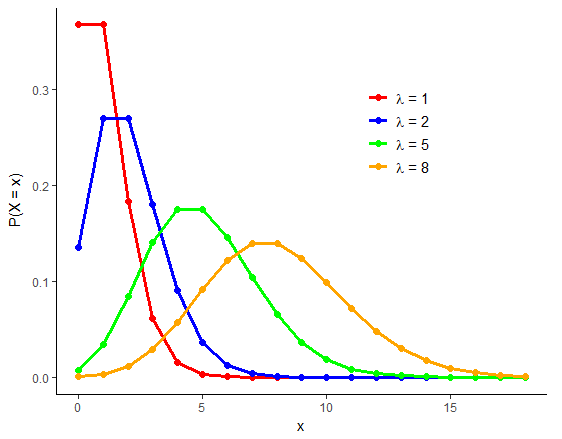 Interestingly, the Poisson distribution is an extreme case of the binomial distribution, as can be shown by asymptotic properties of the latter. Poisson himself thought of this statistical tool when he tried to figure out the number of wrongfully convicted by the French judiciary system. The Poisson distribution has since then found various applications. It was developed to approximate chances of winning random games. Statistician Wladyslaw Bartkiewicz, who made the Poisson distribution formula functional in the late 19th century, famously fitted this model to the data of the number of Prussian cavalrymen accidentally killed by being kicked by a horse. (Apparently one of the Prussian virtues included reliable data collection). It was shown for the first time that such uncommon events can be successfully predicted if we estimate just one parameter, λ. During the Second World War, the Poisson probability definition was effectively implemented in operations research. Military engineers employed it for measuring the accuracy of air strikes, queuing theory, and network traffic models. Today the Poisson distribution is used everywhere, from chemistry to economics. You may find it in sophisticated financial models used e.g. to explore the impact of rare events on efficient portfolio management, or perform stress testing in financial institutions. In particular, it is well-suited to study high impact - low probability events (HILPE) that typical mark the initial phase of financial crises. Poisson distribution is an example of a discrete distribution, which means that the Poisson distribution table works for only non-negative integer arguments. Unlike continuous distributions (e.g., normal distribution), that may generally take a value of any real number, it can assume only a countably infinite number of values. there is no chance of an event occurrence (probability function is undefined for zero events). In the first case, the Poisson probability definition does not work properly when events are serially correlated. Specifically, you can come across many examples of positive autocorrelation in the data: a volcano eruption that makes other volcanoes more likely to erupt, or an epidemic disease displaying high dynamics. Additionally, the Poisson distribution must be augmented when we deal with events for which the value of zero cannot occur (e.g., once a patient is hospitalized, he or she never leaves a clinic after zero days). This problem may be alleviated by using the so-called trimmed distributions, such as the zero-truncated Poisson distribution, which use only a set of positive integers. Poisson Distribution Calculator can be embedded on your website to enrich the content you wrote and make it easier for your visitors to understand your message.